“A twinning is the coming together of two communities seeking, in this way, to take action with a European perspective and with the aim of facing their problems and developing between themselves closer and closer ties of friendship”. This definition was given when the twinning movement started soon after 1945 to bring together towns and countries that had been divided by the War, and it identifies friendship, co-operation and mutual awareness between the peoples of Europe as the primary values, which it represents. It was worded by Jean Bareth, one of the founders of the Council of European Municipalities and Regions, which represents the interests of Europe's governments and their associations in more than 40 countries. 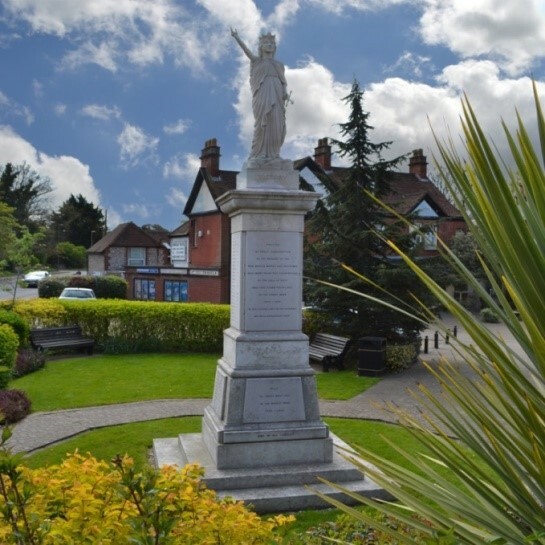 Horndean Parish Council organised a public meeting to investigate the subject of Twinning with another town at the request of members of the public in 1990. After some discussion those present agreed it should be in France. A Management Committee was subsequently formed from those present to find a French town with which to twin. Horndean was initially interested in twinning with the town of Domfront in France and many trips were made including by Blendworth Band as well as school and family exchanges. These continued until 1997 when Domfront announced that the town would no longer be involved in twinning so the formal twinning of Horndean and Domfront was never achieved. 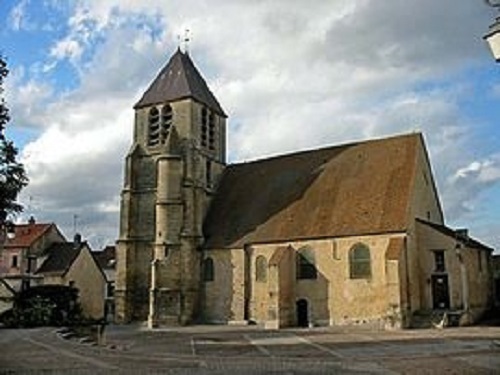 While seeking a new town with which to twin we learned that that Aubergenville in Yvelines, France was interested in twinning with a town in Hampshire. 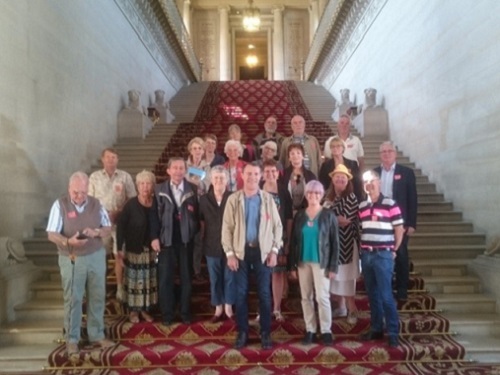 We contacted Aubergenville and after identifying many similarities between our towns and aims, an official charter declaring our twinning was signed on 2nd May 1998 in Aubergenville and on 16th May 1998 in Horndean and our twinning continues to this day. Information about the towns of Horndean and Aubergenville is shown below. 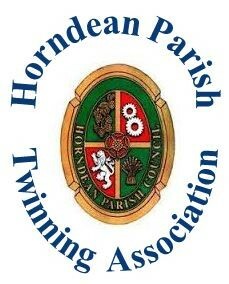 The Management Committee referred to above was the founding of the Horndean Parish Twinning Association, which organises visits by individuals and groups to and from our twinned town with the aim of and developing personal contacts to broaden the mutual understanding of the culture, recreational, educational and commercial activities of our linked communities. 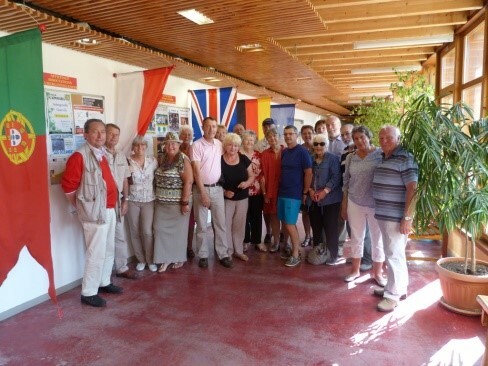 Members of the Horndean Parish Twinning Association make an annual visit to Aubergenville usually in May. The visit is always the weekend when the town holds its Fêtes d’Aubergenville. 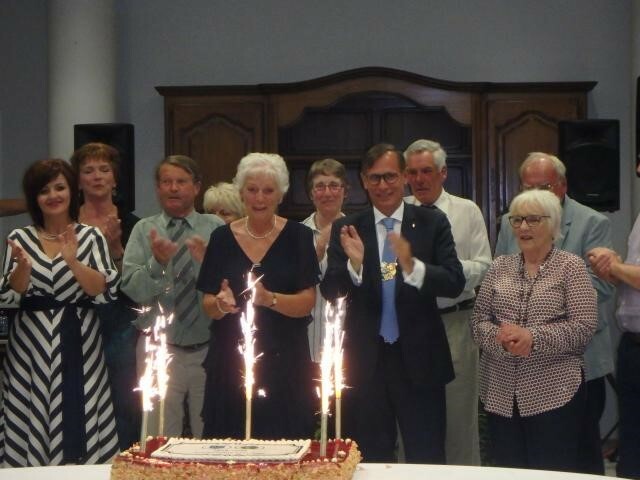 In September 2018, Horndean hosted visitors from Aubergenville over a weekend, which included a meal on Saturday evening to celebrate the 20th Anniversary of the Twinning of our two towns and a trip to Windsor Castle on Sunday. 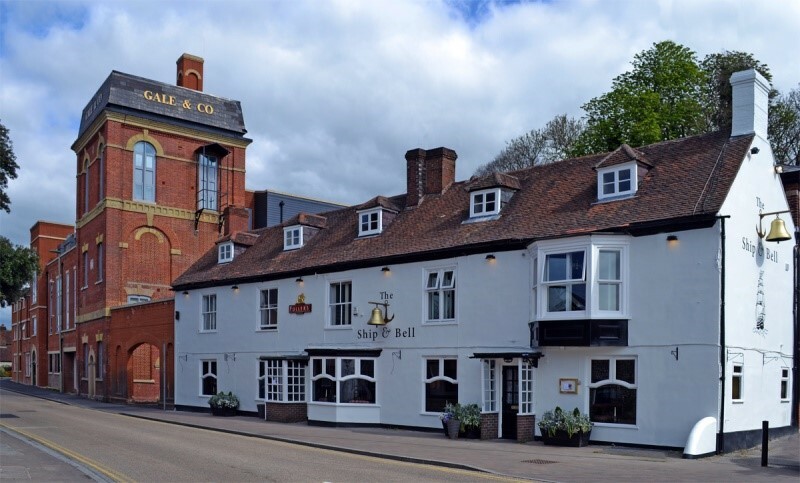 The Association raises all the money it spends on its aims and activities including the funding of exchange visits from an annual membership fee and from social events held in Horndean. These events, which are open to the entire Parish, have included Quizzes and Fish and Chip suppers, Band Concerts, Wine Tasting Events, Hoedowns and Line Dances. 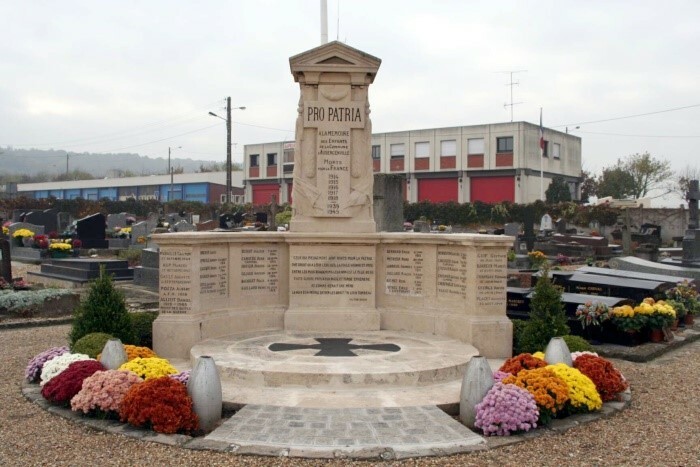 Membership is open to anyone interested in maintaining a link with a French Town. To become a member, it is not necessary to live in Horndean, although because of the activities, it will be more convenient to live in the local area. It is not a requirement of membership to host the people from Aubergenville during their visit in September, although those who wish to and have the accommodation are much appreciated as we are always looking for host families. 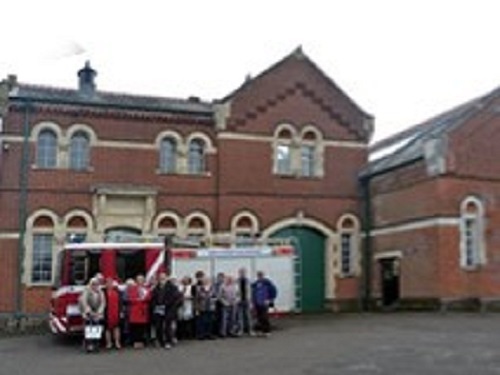 Annual Membership costs £5 per person. If you are interested in joining, please contact one of the Committee Members above or email the Chairman. You can also email the Chairman by clicking on this link. Horndean is a village and civil parish in the East Hampshire district of Hampshire. It is 8 miles (13Km) north of Portsmouth. 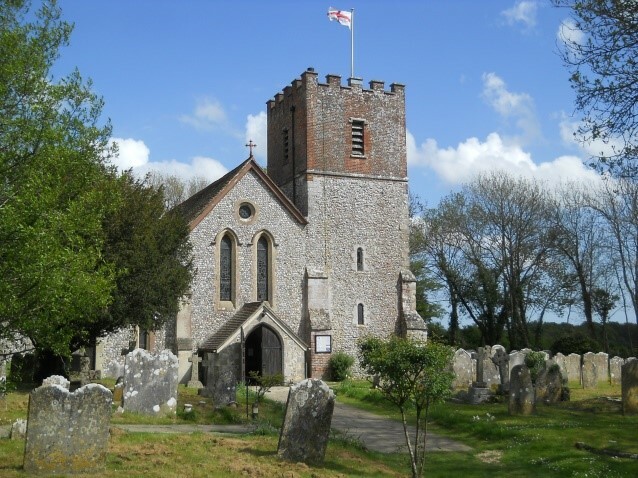 The 2 parishes forming most of Horndean, Blendworth and Catherington, can be dated to the early 12th century although the communities existed before that time. The name of Horndean is found in records of 17th century although it certainly existed in the 16th century, which is when Portsmouth began to grow because of the naval development of the port. Horndean expanded due to its convenient position as a staging post on the road from London to Portsmouth. It was on the road at a junction which meant travellers could go via Havant if they wished to avoid the hazards of the long unbroken stretch through the forest of Bere. The name Horndean most likely means “valley by a horn-shaped hill”. Dean refers to and old English word meaning valley, it can also mean forest. The village experienced significant expansion in the 20th century. The building of the A3(M) motorway in the 1970s and easy access to Horndean encouraged and influx of light industry to the village. The village was probably best known as the home of Gales Brewery, which existed in the village from 1850 and was the largest local employer. It was privately owned until November 2005, when it was bought by Fullers. The Brewery, now closed, has been converted into flats. The Parish Coat of Arms is divided into 4 quarters; Cog Wheels representing local industry, Hops representing Brewing, a Sheaf of Corn representing farming and a Lion "Rampant" represent Simon de Montfort who owned all the land in the area after the Norman Conquest. The Rose in the middle is the Hampshire Rose, the emblem of the County. 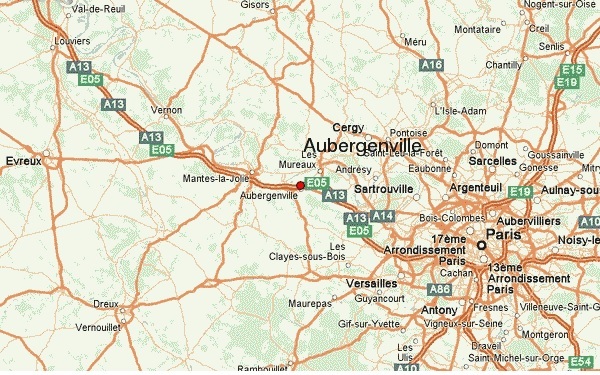 Aubergenville is about 25 miles or 40km North West of Paris and about two hours by road from Le Havre. Its population is slightly less than Horndean but its size is about the same. Like Horndean it also straddles a Motorway! The city is located at the meeting point of two valleys; to the west the Mauldre Valley and to the north the Seine Valley which still contains evidence of having been inhabited since prehistoric times. The settlement of the current town dates back to the 4th century BC and Aubergenvilloise agriculture is distinguished at this time by the size and importance of its vineyards. Built at the foot of hillsides, the old village is located around the church, in a concentric way. With its narrow streets, it is an intimate and closed atmosphere that emanates and gives it a village spirit. On the other side of the A13 motorway is the district of Elizabethville (named after the Queen of the Belgians) which was built as part of Aubergenville between 1922 and 1928. It is built on the alluvial plain, near the station. It is a ‘Garden city’ located along streets radiating from the Place de l’Etoile and consists of a set of about 150 villas, a golf course and a casino. The Renault factory complex and the park are also located within this area of Aubergenville. A new logo was adopted by Aubergenville on 5th June 1990. It is part of an open circle signifying the radiation and the unity of the city. It is composed of in dissociable elements: the letter A (for Aubergenville) is at its centre: it is crossed by a line of blue brush representing the Seine; the last letters of the word “Aubergenville”, highlighted with red, are a reference to its urban character. As for the left side of the logotype’s circumference, its green colour brings us back to the privileged environment and respect for the environment to which Aubergenville is attached. This green border is lined with a series of grey pixels that represent the importance of its industrial and tertiary activities.